"Wu Xi" redirects here. For the footballer, see Wu Xi (footballer). For other uses, see Wuxi (disambiguation). Wuxi (Chinese: 无锡) is a city in southern Jiangsu province, China. The city borders two other large cities, Changzhou to the west and Suzhou to the east, and borders Zhejiang Province as well in the south. It also covers a coastline of the Yangtze River in the north and two separate coasts of Lake Tai. Wuxi is noted for its modern industry and commerce, along with its resorts around Lake Tai. Wuxi is a famous historical and cultural city of China. It has been a land of fish and rice since ancient times. Wuxi is the cradle of China's national industry and township industry. Wuxi means "without tin" literally. The name "with tin" (有锡) was once adopted during the short-lived Xin Dynasty. Despite varied tales, many modern Chinese scholars favour the view that the word dervived from the "old Yue language" or, supposedly, the old Kra–Dai languages. There is an account about brothers Taibo and Zhongyong among several ones that they made Meicun the state of Wu's capital. The region was variously occupied by the state of Yue, Chu and Qin. Wuxi county was founded in 202 BC originally. It was a part of Kuaiji Commandery during the Western Han, later Wu Commandery. As a part of Wang Mang's regime, the place name Wuxi was once changed to Youxi (有錫), meaning "with tin", until his death. The county was dissolved and put under the jurisdiction of Director of State Farms in Piling (pling diannong xiaowei, 毗陵典農校尉), when the area was dominant by Wu. Restored in 280, it was annexed by Jinling Commandery (later Changzhou), since the Eastern Jin. Agriculture and the silk industry flourished in Wuxi and the town became a transportation center under the early Tang Dynasty after the construction of the Grand Canal. Although Suzhou became the center of the Wu area, Wuxi was also important in the county of Wu. Donglin Academy, which was restored in Wuxi 1604, is the cradle of Donglin movement. 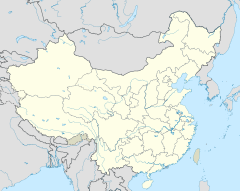 As a populous county, its eastern part was separated to found Jinkui (金匱) county in 1724. Both Wuxi and Jinkui were utterly devastated by the Taiping Rebellion, nearly 2/3 of their population was killed and their depleted “able-bodied males” (ding, 丁) were only 72,053 and 138,008 in 1865, versus 339,549 and 258,934 in 1830. The Taiping rebellion killed 190,000 Wuxi people out of 300,000. Jinkui was merged into Wuxi in 1912. Map showing the city Wuxi (arrowed) and its relation to the city of Shanghai, the Yangtze river and Lake Tai. According to the 2010 Census, the prefecture-level of Wuxi has a population of 6,372,624, an increase of 1,192,777 from the 2000 census, giving it a population growth of 20.9% for the period 2000-2010. The prefecture-level city of Wuxi administers seven county-level divisions, including 5 districts and 2 county-level cities. The information here presented uses the metric system and data from 2010 Census. These districts are sub-divided into 73 township-level divisions, including 59 towns and 24 subdistricts. Wuxi is a regional business hub with a GDP per capita of ¥126,000 in 2014, ranking it first in Jiangsu, ahead of Nanjing and Suzhou. The city has a rapidly developing skyline with the opening of three supertall skyscrapers (300 metres or 980 feet) in 2014. These buildings are the Wuxi IFS, Wuxi Suning Plaza 1, and Wuxi Maoye City - Marriott Hotel. There are 7 other skyscrapers between 200 and 300 metres (660 and 980 feet) tall including the Yunfu Mansion. The city has extensive manufacturing including large industrial parks devoted to new industries. Historically a center of textile manufacturing, the city has adopted new industries such as electric motor manufacturing, MRP software development, and solar technology. Two major photovoltaic companies, Suntech Power and Jetion Holdings Ltd, are based in Wuxi, making the city a hub for solar technology in China. Bicycle manufacturing for international brands is another industry, including bicycle assembly and bicycle component manufacturing. One of the two Chinese factories of Taiwan-based brake manufacturer Tektro is in Wuxi. Hynix completed a new chip plant in Wuxi. Established in 1992, Wuxi Export Processing Zone is located in Wuxi New District with a planned area of 2.98 km2 (1.15 sq mi). The encouraged industries include electronic information, optical-mechanical-electronic-integration, precision machinery, and new materials. It is situated near to Wuxi Airport and Changzhou Port. As an important city for the "Wu" area, Wuxi is one of the art and cultural centers of "Jiangnan". Its culture bears distinctive characteristics, which can be identified in its dialect, architecture, waterway transportation and various art types. Local folk arts include Huishan clay figurines and clay teapots. Several famous Chinese authors claim Wuxi as their home town. Among them, most recently, Qian Zhongshu, author of Fortress Besieged, a comedy of manners set in China in the 1930s. Wuxi was the birthplace of the famous Chinese (later American) artist Chen Chi (1912—2005), in whose honor a museum has been erected in the city. In modern times Wuxi has produced a number of cultural figures such as Hua Yanjun (1893–1950) also known as "Blind Abing" (瞎子阿炳), famous for his erhu and pipa music. Another famous musician is Liu Tianhua, who was the first to compile folk music using staff. Wuxi is a major tourist area of the Lower Yangtze Delta. It has natural and man-made places of interest. The city was built on the shore of Lake Tai with the lake providing a rich tourism resource. Noted spots include Yuantouzhu (the Islet of Turtlehead) and Taihu Xiandao (Islands of the Deities). Passengers can enjoy the scenery of Lake Tai and the city center on a 115-metre (377 ft) tall Ferris wheel that takes 18 minutes to complete one revolution. At night, lighting effects are switched on around the wheel. Literally "Tin Mountain" and "Kindhearted Mountain", Mount Xi and Mount Hui are two small hills in the western part of the city. The classic royal Ji-chang-yuan Gardens are at the foot of the hill as well as the Tianxia di er quan (天下第二泉), literally "the second spring under heaven"). The Grand Canal passes through the city. There are two canals: one is the old one that has been there since it was excavated, the other is the new canal created after 1949. Wuxi has many private gardens or parks built by learned scholars and rich people in the past. Among these, Li Yuan, Mei Yuan are good examples that have been well preserved. Xihui Gongyuan (Xihui Park),at the foot of Xi Shan also houses historical relics, notably Jichang Garden. Lihu Park is another popular park, owing it popularity to legends that Fan Li and Xi Shi boated here. Fragrant Cedar Pavilion (Chinese: 香楠厅; pinyin: Xiāngnán tīng) is a protected site, which was dedicated in the Ming dynasty to Consort Duan by her father after her execution for involvement in an assassination attempt against the Jiajing Emperor. Wuxi's Mashan Town was built during 16th–19th century A.D.. The town is in the northwest part of Wuxi on the west bank of the Grand Canal and at the foot of Mount Hui. The town's buildings are mainly family ancestral halls. South of the Long Mountain, near the town, is the 88 metres (289 ft) tall Grand Buddha at Ling Shan, one of the largest Buddha statues in China and the ninth tallest statue worldwide. In the western part of Wuxi, the district is classified as a AAAAA scenic area by the China National Tourism Administration and consists of Wuxi Three State City Park, Tang City, and Shuihu City. Established in 1987, it was the first film studio in China. CCTV Wuxi Film/TV Studio used the studio for the shooting of The Three Kingdoms and Water Margins. In Yixing (part of Wuxi), Shan Juan Cave is a four-star scenic zone. The folktale figures of Liang Shanbo and Zhu Yingtai were said to study behind the cave. Other historical places include the former residence of Xue Fucheng, former residence of A Bin, former residence of Xu Xiake, site of Luotuo Dun, Taibo Temple and Tomb, and Donglin Shuyuan. Wuxi has two stadiums. The old stadium is in the southern part of the city and has yet to reopen. The other is Wuxi New Stadium, which consists of a swimming stadium, soccer stadium and other facilities. It is located in the south-west part of the city, near Lake Tai. Major League Baseball has also had its main Chinese Development Center in Wuxi since 2008. At the Development Center, Major League Baseball scouts and recruits the best players in China to play at the DC in the hopes that they will eventually play professional baseball in America. Wuxi is situated on the Shanghai–Nanjing Intercity High-Speed Railway, linking it directly with the provincial capital of Nanjing (1.5 hours), China's economic hub, Shanghai (45 minutes) and major economic hub and tourist destination Suzhou (24 minutes). Sunan Shuofang International Airport (IATA: WUX) opened in 2004 and serves the cities of Wuxi and Suzhou. It is situated 14 kilometres (8.7 mi) from the city centre and has direct flights to Beijing, Guangzhou, Shenzhen, Hong Kong, Taipei, Singapore, and Osaka. ^ Zhou, You, Zhenhe, Rujia (1986). 方言与中国文化. Shanghai People's Publishing House. pp. 153–4. ISBN 9787208009653. ^ a b c 中国历史大辞典·历史地理卷 [The Great Encyclopaedia of Chinese History, Volume on Historical Geography] (in Chinese). Shanghai Cishu Press. 1996. p. 105. ISBN 7-5326-0299-0. ^ Zhengzhang, Shangfang (2012). 古吴越地名中的侗台语成分, 古越语地名人名解义. 郑张尚芳语言学论文集 [Zhengzhang Shangfang's Symposium on Linguistics]. Zhonghua Book Company. ISBN 9787101061055. ^ 江苏省志・人口志 [Jiangsu Provical Gazetteer, Volume on Demography]. Fangzhi Publishing House. pp. 58–9. ISBN 978-7-801-22526-9. ^ City of Wuxi (2013-09-26). 【2012】无锡市国民经济和社会发展概况. ^ "RightSite.asia - Wuxi New District". ^ synyan (2008-10-19). 梁溪漫志(07)：蠡湖城太湖之星 (in Chinese). Retrieved 2012-04-25. ^ Gu Yuefei (谷岳飞) (13 July 2013). 无锡曹端妃无字牌坊穿越470年 系真实版"甄嬛传" [Consort Duan's blank memorial in Wuxi extends back over 470 years. This is the true "Empresses in the Palace"]. China News (in Chinese). Retrieved 27 June 2017. ^ "AAAAA Scenic Areas". China National Tourism Administration. 16 November 2008. Archived from the original on 4 April 2014. Retrieved 9 April 2011.